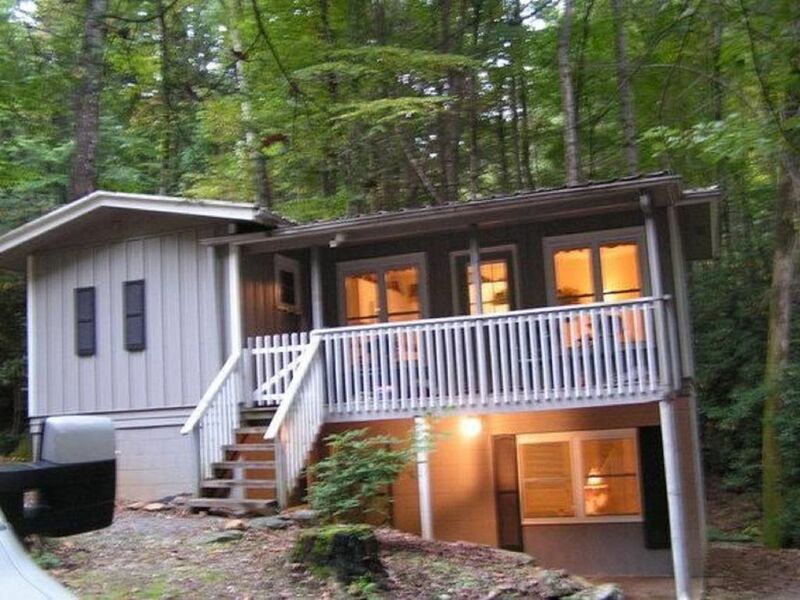 2 Bedroom 2 Bath Cottage Close To Many Activities And The Blue Ridge Parkway. **The master bedroom, 1 bath and kitchen are on one floor. The master has a very comfortable queen size bed, flat screen TV, alarm clock, ceiling fan and a window air conditioner, but you may never need to use it. The bathroom has a blow dryer and a heat lamp for showers on those colder days. The kitchen includes coffee maker, crock pot, hand mixer, grilling utensils, and dishwasher, and ceiling fan. From this level you can sit on the front deck and relax while listening to the wind through the leaves and many other sounds of nature. **The second floor bedroom has 2 sleigh beds, ceiling fan and their own bathroom. The living room has a ceiling fan, flat screen TV, DVD player, books and games. There is an electric fire place that has settings to keep you warm and cozy, or to use just for the ambiance. The second floor, on one side, leads out onto a small patio where the grill is, and on the other side, it leads to a deck that you can sit and listen to a babbling brook. ** Golf Courses: Waynesville CC (27 holes par 70); Maggie Valley Resort Resort & CC; Lake Junaluska Golf Course (18 holes par 68); Iron Tree Golf Course (18 holes, par 69); Junaluska Driving Range (open 24 hrs); Laurel Ridge CC (18 holes, par 72); Springdale CC (18 holes, par 72). **Thunder in the Smokies Motorcycle Rally at Maggie Valley Festival Grounds. Great Smoky Mountain Railroad offers the Biltmore Estate Wine Dining Train, gourmet dinner pairing premium wines from Biltmore Estate. 800-872-4681. In downtown Waynesville...July brings Folkmoot International Festival. Enjoy performances, parades and workshops by more than 350 performers from a dozen countries. In Cherokee... mid-June - August - Indian Drama, 'Unto These Hills' outdoor event. - learn about native history at Oconaluftee Indian Village. Enjoy dining? Enjoy steaks at J. Arthur's (Maggie), breakfast at Joey's Pancake House (Maggie), or authentic Mexican fare at Los Amigos (Waynesville) or Guayabitos (Maggie). Granny's Chicken offers family-style foods! **There are brochures and menus, on the shelf in the kitchen. There is also a journal to let other guests know what your favorite places to eat and visit. **Maggie Valley is close to many exciting and interesting venues. The cottage is within walking distance, if that's what you enjoy, to Soco Rd, the main road through Maggie Valley, where you'll find many restaurants and shops. **15 minutes from Cataloochee Ski Resort. **There's something exciting to do everyday. If you just feel like relaxing at the cottage, relax in one of the rockers on the front deck enjoying a cup of coffee or a glass of wine. **If you've never been to Maggie Valley, I guarantee you'll fall in love, and want to keep coming back. We visited Maggie Valley in the fall of 2013. I wanted to go when the colors were at their peak. I grew up in Michigan, and missed the sound and smells of the leaves on the ground. I'd never visited NC, but my husband had....It was love at first sight. To sit on the deck and listen to the wind blowing threw the trees. The birds even sound different. The cabin we rented had a stream up the road, you could even hear that because the area is so tranquil. We also liked the fact that it was within driving distance of so many other places. Also, we live in Florida, and we wanted some where to go to get away from the awful humidity. There is a little brook behind the house, I really liked the idea of sitting on the back deck and being able to listen to "our" brook. In walking distance from Socco Rd, the main street of Maggie Valley. There is an electric fireplace, heater. Catalooche Ski Resort and Tube World are only 6 miles from the cottage. Not on site, but close by. Read "About Property" under the pictures. There is no housekeeper, but after you check out a cleaning lady does come in and does the laundry, bathrooms, kitchen and floors. Homey cottage, all the conveniences of home...and then some. close to all of Maggie valley's restaurants and shops, neat house with all of our needs met. we go to the Maggie area several times a year and this is a great location to add to our list of places to stay. We're glad you enjoyed your stay and hope you'll return to the cottage on your next visit to Maggie. My grandson & I met my brother & sister-in-law for a WCU game (to watch my niece in the band). We loved the cabin's neighborhood and wish we'd had more time there. Everything promised on the website was included. My grandson went up & down the stairs constantly; my knees were grateful for the downstairs outside access door! I would stay here again. The guestbook is a nice touch with experiences others had-wish we'd had time to try some of them. We're glad you enjoyed your stay at the cottage. I hope you'll choose us for your next visit to Maggie, and maybe stay longer to enjoy everything Maggie has to offer. The cottage was very clean and well equipped. Cute and comfy. It is quiet and in a lovely setting but close to restaurants and very convenient to the area. We enjoyed our stay at the property. Very nice little cottage. Clean with everything you need to enjoy a get away. Thank you! We're glad you enjoyed your stay, Rick. We hope you'll come again. The Belle cottage was very well equipped with anything you would need. Very clean. Enjoyed our stay. We're so happy you enjoyed your stay, and hope you'll think of us for your next vacation.